Alex Garo at Camper & Nicholsons tells me that they have been appointed as worldwide charter Central Agent for the 40m (131ft) sailing yacht Philanderer, in addition to Camper & Nicholsons' Arne Ploch listing her for sale. 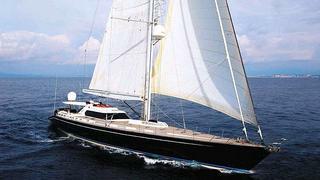 Built in 1992 by Concorde Yachts, Philanderer is the sister ship to the renowned Mirabella series. Currently the largest sailing yacht available for charter in Spain, she was extensively refitted in 2009, and today represents a modern, fast performance sailing yacht with huge volume. Philanderer comfortably sleeps up to 10 guests in five well-appointed staterooms. Her accommodation includes two double staterooms with en-suite bathrooms, two twin staterooms and one bunk-bedded stateroom with en-suite shower-rooms. The yacht’s bridge is an enclosed area surrounded by large windows, providing a perfect view of the ocean regardless of the weather. Down the stairs forward is Philanderer’s comfortable saloon to port and dining area to starboard. She has a spacious aft deck sheltered by a Bimini that has proved to be a popular spot for alfresco dining. She is also equipped with a sauna and a gymnasium.